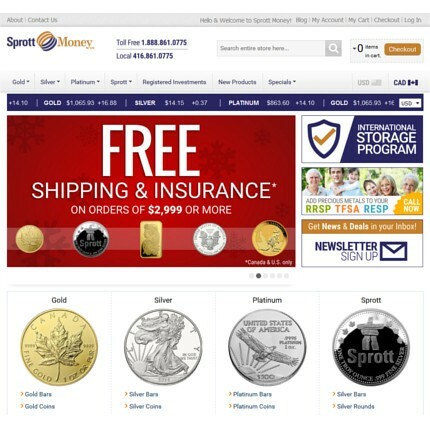 Sprott Money Ltd. is a leading international gold and silver bullion dealer since 2008. Our company strives to facilitate ownership of precious metals no matter how big or small your portfolio. Since our inception, we have prided ourselves on superior customer service, providing our clients with only the highest quality bullion products, in addition to delivering them discreetly and on time. Monthly interviews with world renowned industry experts such as Jim Rickards, Marc Faber, Jim Sinclair and Ted Butler. The products are excellent, especially the Sprott1oz rounds, The site is easy to navigate, and receipts for payment and shipping were received very quickly, and the items were here within 3 days of ordering. Very impressive product, and shipping time, especially when compared to some others who wait 2-3 weeks before shipping. Will definitely be ordering from Sprott again very soon. Very happy with the purchase, I got exactly what I want, excellent deal and a sealed tube. Also, my order arrived the next day after Sprott Money Received the money, I like that very much, I will buy again from Sprott Money and recommend them to a friend. Very easy to order on line with a variety of payment methods. I liked bill payment method through the bank. Follow up emails confirmed order status as well as a personal phone call from the company to ensure my satisfaction. Will always use Sprott Money now for purchases. Exceptional first time service experience. User interface for account creation and trade execution was exceptionally slick, intuitive and easy to use. Sprott Money eliminates the grief of the FINTRAC and KYC process. Will definitely use them again. The guy whose name is on the company monicker earned his reputation as being a no BS, stand-up guy. Eric Sprott's fingerprints are all over this. Well done. Thank you for the smooth execution of the transaction. Whole process was efficiently handled and money was processed very quickly. Questions sent regarding the transaction was answered promptly. Appreciate the great service! I've dealt with Sprott Money numerous times. It's all been good, no problems, no complaints, and no hidden fees. 10,000 % Satisfaction - Can't be beat! Words cannot express the outstanding excellence of Sprott Money Ltd. staff, products, storage & reliability. We have dealing with them now for 4 1/2 years & have always found them to be efficient, accommodating & reliable. In to-days world, TRUSTWORTHINESS is priceless & rare - Sprott possesses this in spades! It has been a pleasure working with Robert DeJaray on the purchase and storage of precious metals. Robert was very generous with his time in answering all my questions, explaining the process and taking care of my needs. I very highly recommend Sprott Money. Never purchased precious metals from a dealer before. The entire process was simple and quick to complete and the staff was readily available for any questions I had. I am very satisfied with sprott I recommend them to anyone who wants to purchase metals. They are very professional. We did our first large purchase a few years back with Sprott Money. Since it was our first purchase through them, Sprott obliged us with some special requests and the purchase was smooth as Gold. We are very happy with their service. From great pricing, transparent transactions and friendly approachable and very helpful staff. Will definitely recommend Sprott Money as a solid PM dealer. Outstanding dealer! I ordered through Sprott for the first time three years ago and they fielded my questions with confidence and assurance. When I received my order I was very happy with the speed and accuracy with the order. Since that was the first time ordering with Sprott, I had a made a special request with my order which they executed to the T.
Just got off the phone with Brandon Green of Sprott helping me with International storage. He was very friendly, helpful and genuine. I'm reasy to order again. I met Brandon Green of Sprott Money while in the Cayman Islands attending a conference. I ordered some silver from him shortly thereafter. Brandon was easy to deal with, he gave me a good price for my silver and the shipping time was ultra-fast. I recommend Sprott Money as a dealer and would buy from them again. In our experience Sprott has been an impressive dealer. The money team is quick to answer any and all concerns and shipping is fast. Sprott Money is a fantastic dealer. The service is quick and pleasant, no waiting, no problems. Audit fees are a bit steep, but aside from that I have be thrilled with the experience. Outstanding Products, Staff, Service & Storage - 2nd to NONE! Words cannot express the satisfaction we have had with Sprott Money Ltd. We feel they are the best in North America for their great selection of quality products, prices, assistance by an excellent staff & unsurpassed safe storage with reasonable fees. We have been buying on a very regular basis & our only regret is that we did not start earlier in life. We have great peace of mind in every aspect! Great service, no problems with quality or delivery times.